We all know Hog’s Breath Café and their signature 18 hour Prime Rib Steaks. Renowned for their generous servings, casual saloon style atmosphere and great service otherwise known as “Hogspitality’. Hog’s Breath Cafe has provided reliable and consistent dining across Australia since 1989. 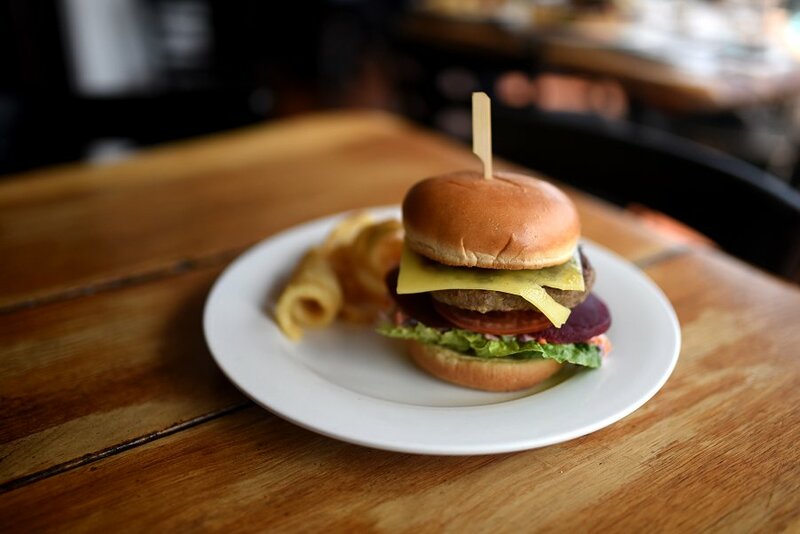 This week Adelaide Food Central dined at Hog’s Breath, Glenelg to explore the burger menu. There are 8 burgers on the Hog’s Breath menu, as well as a Steak Sandwich. 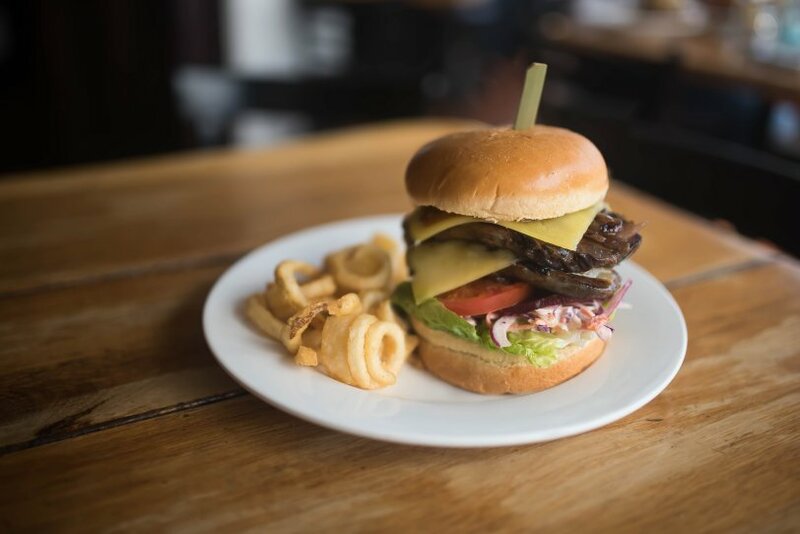 All burgers contain the same base ingredients; sliced beetroot, tomato, cos lettuce and ‘Hogslaw’ which – you guessed it, is the Hog’s Breath take on coleslaw. Ruby cabbage, carrot and Spanish onion are combined with a creamy dressing. The vegetables retain crunch and it is a tasty and satisfying mix. All burgers (with the exception of the steak sandwich) are packed in a slightly sweet brioche bun and they are all enormous. Hungry Jacks promote their Whopper saying that two hands are needed to eat the burger. In this case you need the flip top head like the Reach Toothbrush commercials. Most are too big to bite straight into and the use of cutlery is required. Let’s take a look at a few to see what you get when you tuck in. The Cheese Burger in Paradise is not a traditional cheeseburger given the inclusion of salad and slaw. It contains a beef mince patty full of flavour and seasoning. BBQ sauce is a delicious addition that adds to the tropical notes given by the slaw and beetroot. 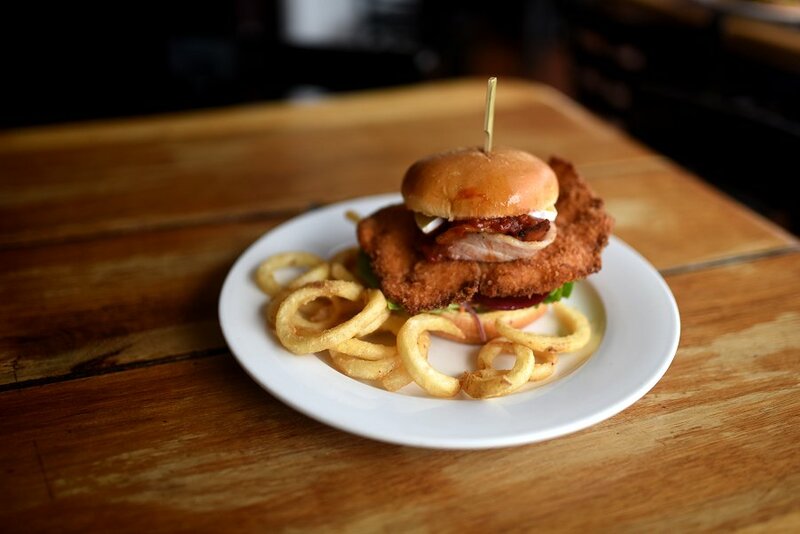 The Crispy Chicken, Brie and Bacon Burger contains a huge panko crusted breast schnitzel that hangs out the side of the bun like wings. It is delightfully crisp and pairs well with the standard burger ingredients. A couple of thick slices of brie melt into the chicken. A generous serving of grilled bacon is topped with a tomato chilli jam. The Serious Steak Burger contains not one but two whole steaks. They do mean it when they say serious! In true Hog’s Breath tradition the steaks are so tender they are very easy to bite into. Not a hint of chewiness or gristle. The steak is topped with grilled onions and a delicious chilli sauce that has a fruity, chutney taste. The Grilled Lamb Burger is built around a lamb patty that has a distinct Greek flavour. It is finished with a mint yoghurt which is very complementary to the lamb. 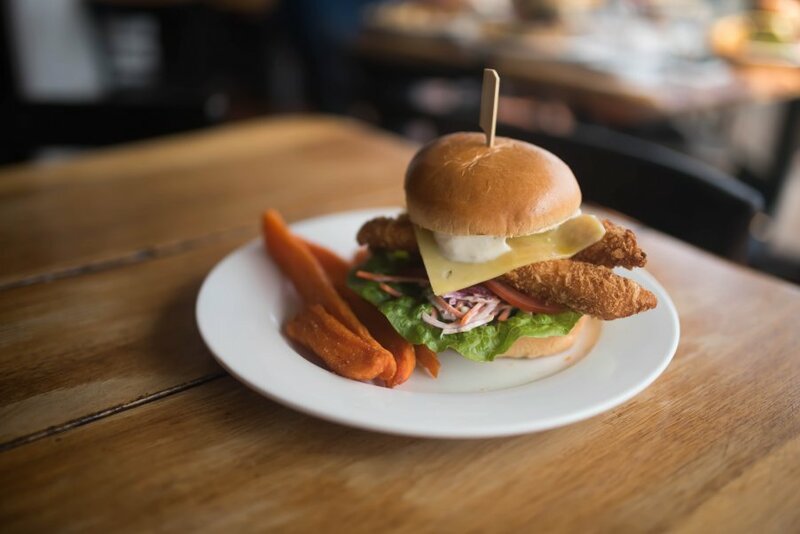 The Crispy Flathead Burger contains a large portion of crisp deep fried fish fillets matched with tartare sauce as well as the usual burger trimmings. 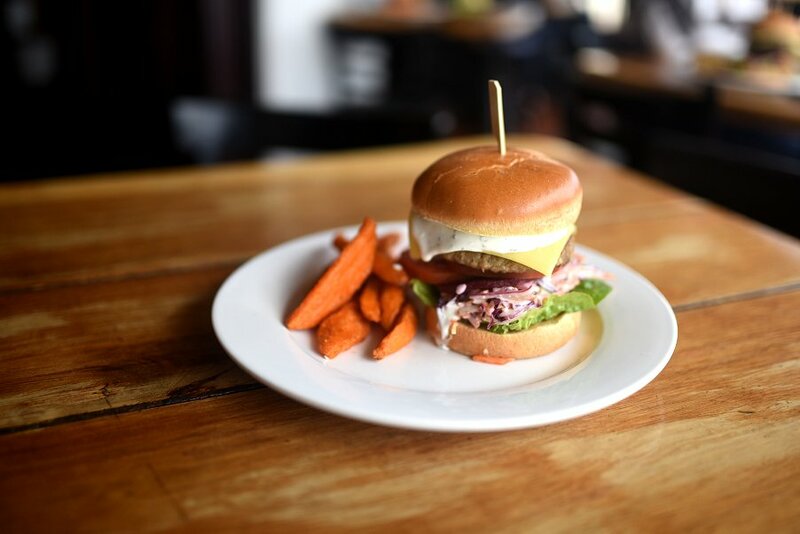 Each burger is served with your choice of signature curly fries or sweet potato chips. Hog’s Breath is so much more than just a steakhouse. It has other great alternatives this burger range is certain to please.